I’m now a few weeks into a training programme, and I’m rather impressed with my progress. Perhaps I haven’t had any real increases in fitness, but the structure of high intensity workouts followed by periods of rest have lead to some very strong performances. Notably, at the Mitchell St Criterium the other week, I managed to sustain a much higher average power output than I have on a flat course before. For that 27 minute effort, my watts per kilo were considerably higher than they were a few weeks prior when I completed a 20 minute FTP test. Another week of mostly resting and I am back into another hard week, and with one intense hour completed, I’m feeling very lethargic and rather unmotivated. Fortunately I can engage that part of the brain that usually only functions for me on very long endurance rides, and convince myself that getting up to do the same hard things again is actually fun. The first full week of actual work is over. A mixture of hard efforts, recovery rides, yoga and cardio, both indoors and out on the road. Was it hard? Some days, yes. Was it manageable? Definitely. Will I keep going with it? Without doubt. Having spent a couple of weeks in my definition of a relaxation mode, I’d been chomping at the bit to thrash my legs on the pedals. And the first week of training did not disappoint. It was encouraging. Thus far, the sessions have been on the short side, mostly because of the time constraints I have, but also to focus on building power. This has meant I’ve typically had a very hard hour on the bike, followed by a normal day. But after each of these short sessions, I find myself wanting to go back into them. Perhaps my intensity needs to lift, or perhaps I need to become more patient with the importance of recovering. The best part? I’m feeling amazing! I’m not sure if the rest leading into the programme is the difference, or maybe it’s the targeted training – either way, I feel like I’m getting stronger already. My legs get heavy, but bounce back quickly. I feel as though I can breathe deeper. I’m putting out more watts at a seemingly lower heart rate. And I don’t feel as though i’m going to crash and burn – having recovery days during a hard week are clearly a good thing right now – and soon enough I’ll have a full recovery week. It’s too early to make claims about improvement, but I’m pretty sure this is all getting me somewhere. I’ll let you know how I go at the end of the week – perhaps another 7 days will knock me back some. Immediately afterwards I felt dizzy. Soon after that I was still shaking and my legs were sore. By lunch time my legs were shot. 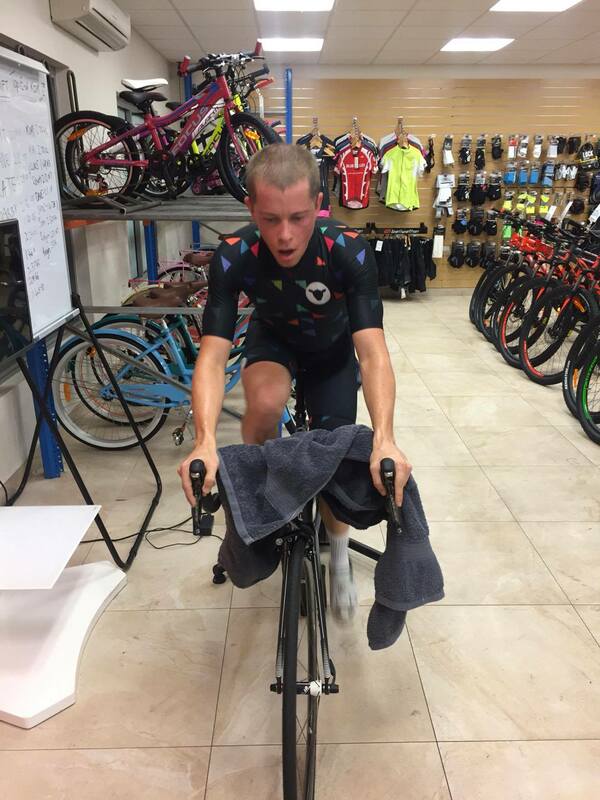 All after beginning a new training programme this morning with Matt, commencing with an FTP test. I’ve done an FTP test a couple of times before, on the home trainer and in front of Zwift. The first couple of times were mere attempts, with the connection between my power meter and laptop dropping out, or simply popping before 20 minutes had elapsed. This morning’s was different – I had a coach, the equipment was there, and I had a better understanding of what I’d be getting myself into. Briefly, FTP (Functional Threshold Power) is the highest average power a cyclist can maintain over an hour. Typically, a 20 minute test is used, and 95% of your average power over the 20 minutes is taken as your FTP. This will serve as the base line for my training over the coming months. I met Matt at the shop at 5:30am, and he proceeded to set my bike up into a stationary trainer (this one). An excellent set-up, as I would be using my own bike and power meter – so everything can be transferred onto the road. After a 20 minute warm up, consisting of some easy pedalling and a few harder efforts, Matt then worded me up for what he wanted out of the 20 minute test. And he threw a curve ball at me – no data! I would have no monitor to look at, nor would I be able to utilise my Garmin for reference. No heart rate, no timer, no power! And it was brilliant. I don’t know if it made the effort easier or harder, but having no numbers to look at, I was forced to feel it out and judge my riding. Matt would occasionally act the clock, letting me know either how much time had been covered, or how much time was left (are you a glass half full, or half empty kind of person?). He also made a poignant comment just before the test. It’s something I had worked out through endurance rides, but will now start to apply it more to the riding I want to get better at. The brain will want to give up when the muscles are capable of giving more. I need to break through the glass walls. With the 20 minutes covered, I found myself breathing heavily. Head dizzy. Hands shaking. Heart pounding. I was left to spin out my legs with sweat streaming all over me, and a few moments to compose myself before getting off the bike. Only after that did Matt approach me with congratulations and some numbers. Numbers I’m not going to publish just yet – I’m not going to be a total Froomey about my data, just a little bit. I plan on doing another test at the end of the 3 months, and will have a comparison to share at that point. Until then, I will reveal that I don’t think I could have gone any harder during today’s test. My FTP was considerably higher than when I measured it myself using Zwift, but it is perhaps lower than what some of you may expect. And most importantly, I have been reassured by Matt that I will improve. After sleeping in two mornings in a row, I was keen to get back on the bike. A dose of antihistamines last night almost thwarted attempts of getting out of bed again though, and for 3/4 of the ride I felt like I was drifting off to sleep. It was akin to a 24 hour ride – fighting off fatigue and waiting for the sun to boost serotonin levels. Do i avoid the phenergan tonight for an easier wake up? Or risk a night of broken sleep of scratching? Beaten by Hanson and the midges. With many Darwin cyclists in Tenant Creek for the race, there was only a small turn out for the Green Ant bunch ride. Very relaxed pace and shortened route wasn’t disappointing as I’m still recovering from last weekend, but I’m getting keener to really test the legs again. It was feeling like we’d have a decent tailwind up Berrimah hill, so I figured I should have a decent crack. It was more of a south easterly than the southerly I would have liked, and had to start from standing at the lights (I really wanted to storm in at speed! ), but I still gave it a good go. A truck overtook me halfway up the hill, so I jumped in its draft for the last part of the hill, but couldn’t quite latch on. Luckily, the wind felt more at my back once the hill topped out, and I was able to hold a high speed for the remainder of the segment, which is about 900m of flat. The segment is loaded onto my garmin, but I couldn’t remember the top times, so I just went as hard as I could and watched the distance to go drop until the end. Felt happy enough with the effort (albeit wind assisted), and was stoked to see I’d taken the KOM when I uploaded the ride. I’d best get out on the bike some more today – beautiful weather and need to make the most of it.